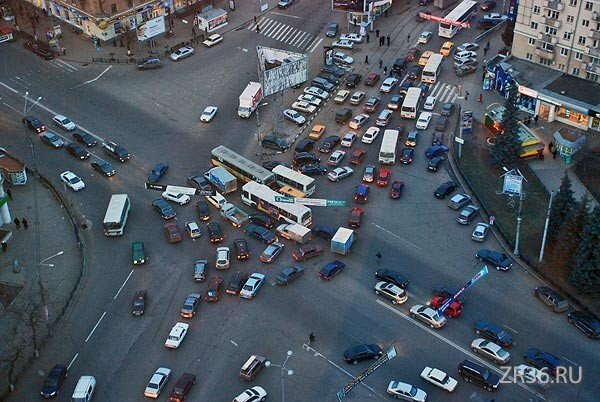 Nowadays the main obstacle to having a car in Russia is not even a bad state of its roads but constant traffic jams. Daily from 6 am to 11 am and from 6pm till 11 pm all the roads are heavily jam-packed. In mornings people trying to get to their jobs and unis somehow, whether by a car or by bus to get to the nearest metro stations to avoid these clogged roads with heavy traffic. And the same thing happens when people coming back home from their jobs and unis, striving to get home to have a meal and to rest after the heavy day of a backbreaking job. 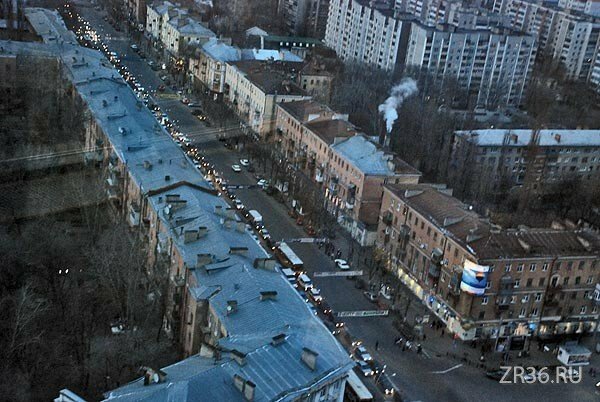 Not only in big cities like Moscow or Saint-Petersburg can you see everyday traffic jams but even in such cities as Ekaterinburg, Perm, Novosibirsk and Voronej. And today we will tell you about the latter by way of example how traffic jam is being born. Usual crossroads in the center of the city. A stream of the cars is going ahead and trying to cross the intersection but freezing because of traffic lights. 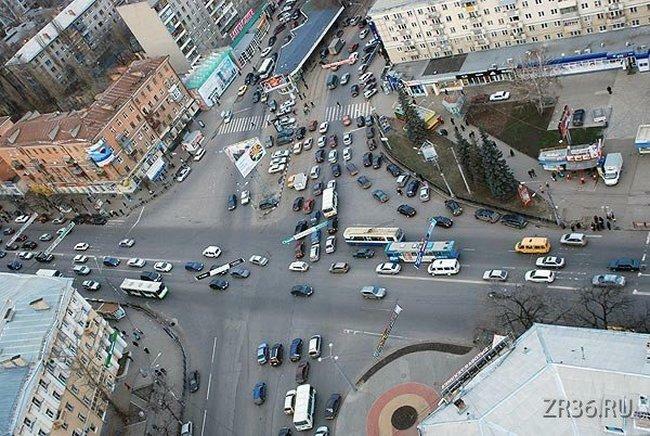 The cars going from the left side are trying to turn left but doing nothing except clogging the crossroads even more. It is not a traffic jam yet, but we can already see its dawning. Now the stream of cars at the left side didn’t manage to cross the road in time and ran into the other stream. Some cars are trying to bypass the buses packing the jam more heavily with it. 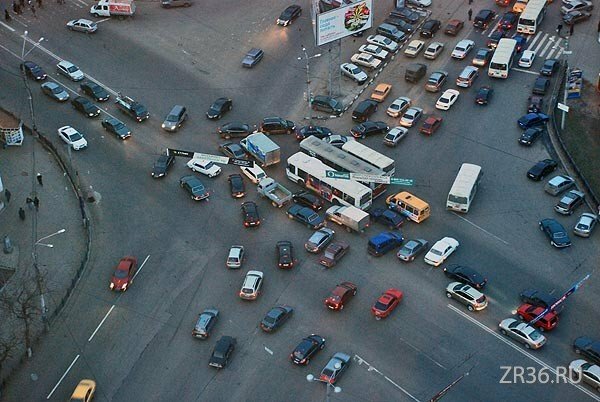 The cars which are trying to turn left join the jam and blocking each another. The streams going forward joined them as well and now nobody looks at the traffic lights and all the cars are moving where it is possible. And at last, the traffic jam is ready. The whole road is absolutely clogged. The solution is obvious. They need special middle lanes for turning left or right [with lights to control the flow.] Plus they need painted pedestrian crossing paths. The solutions are so simple really. 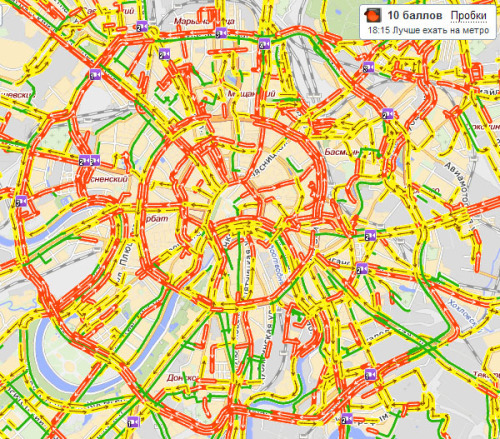 With all those unis in Moscow, aren’t there any courses in Traffic Control? Luzhkov is [email protected] up. Install a separate light signal for left turns = problem solved. As you can see here, _buses_ are the root of all evil. You guys havent been in New York…. Exactly! Compare to Moscow, New York is a paradise!!! Looks like a normal day in Chicago or Rome. Only with Chicago you need more taxis and with Rome you have to throw in hundreds of motor bikes. I see plenty of space to build a roundabout. 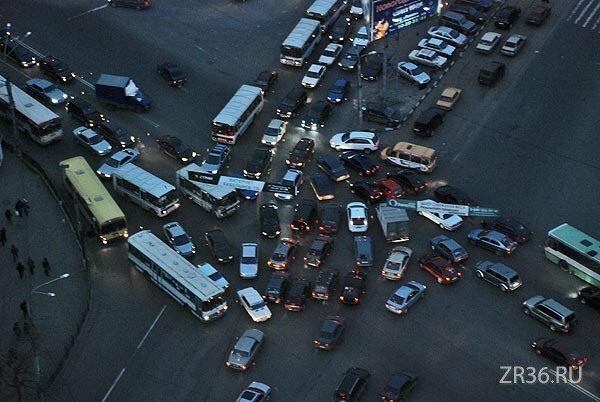 Russians like to create obstacles in order to overcome them. Makes us feel better about ourselves and keep the life more exciting. American roads are just boring and monotonous. I have such a relief every time I come back to US from Russia! Maybe some day you plane crash and US and Russia will be relieved too! Come on let’s be serious. 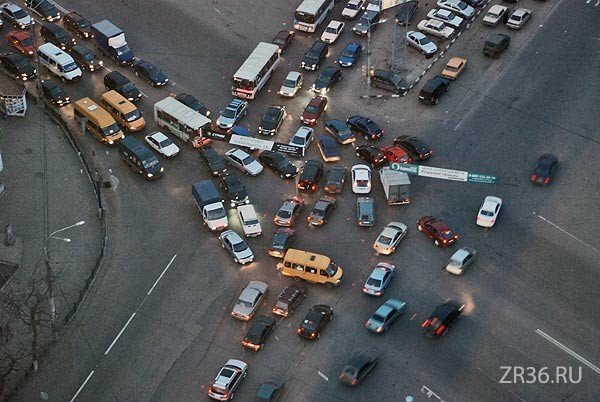 Any 19 year old freshman in traffic engineering course in the US/Europe could solve this problem in five minutes. Russ.Ian’s comment is painfully too true. I notice that a lot of money has been spent on advertising banners at this intersection. Money spent on traffic control…..next to none. If the traffic move too quickly, no one will have time to look at the banners. duh! 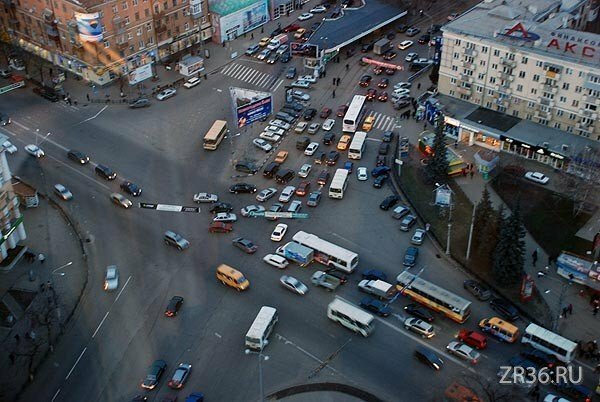 Many cities in USA have roundabouts now.The ones in my city are on roads with less traffic.There are none on major roads.That intersection could have more signals-maybe arching over the streets.It is a wide intersection so maybe that is not possible.A turn arrow on the side of the road would always help. Brings back childhood memories of Mexico! 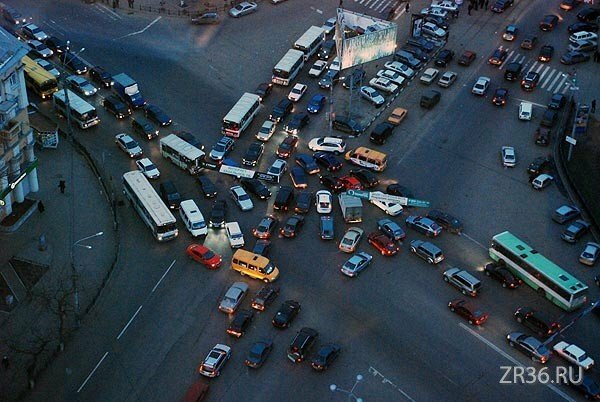 Now that so many Russians drive cars today if possible maybe Moscow could expand the city out more,create more suburbs!Russia has much open space and only so much city space to cram most of the people in. The solution is simple obey the traffic lights and stop thinking you are more important than everyone else and the jams would vanish!!!! Be courteous and life will be easier!!! I hate Russia and russians so much just cant stop visiting this site. You think you are so smart. What a fool. Ask somebody to find you a nick if you cant do it on your own. You’re the only Fool I see! Everyone wants to be first, and no one wants to stop at stoplight. What are waiting for “work at home” system? Many jobs (of course not all) may be doing at people`s house, without necessity of go to fabric or buildings far away of your home. The technology is ready and the people wants to use it. Who give the first step to the future? More people really should try to find ways to work at home. I do most of my work at home ~ I love it! solution is not obvious, for cities above 1 mln. population. especialy for 18 mln of Mosckow daily population. You gave nice ideas here. I done a research on the issue and learnt most peoples will agree with your blog. More and more actual doctors are advising against taking medical advice off of the internet.